My girl Maizey started out as a feisty, independent puppy who would bite me purposely so that I would leave her alone. It has been quite a journey but I have to say that with relationship-based training and positive reinforcement, taking time to really develop skills and not rush her training process, and making play a priority in our sessions, Maizey has become a super family member and agility partner. Maizey became the first dog I have earned a MACH title with, the Master Agility Champion title in AKC agility. We have run together in the 2012 AKC Nationals, the Purina Incredible Dog Challenge, and twice at the AKC Agility Invitational in Florida. This year we focused our trialing time and energy in AKC Agility, and Maizey has completed her MACHs 2, 3, & 4 in the last year, and is two double-Q’s away from MACH 5. She has earned 3,175 points this year as well. 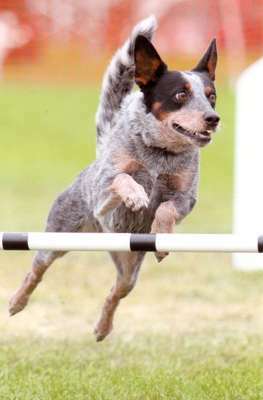 For her efforts, Maizey has become the #1 Australian Cattle Dog in AKC Agility for 2013!! I am so proud of her, she is such a good girl, always trying for me every time I ask. This is the first time I have had the #1 ranked dog in the country, another special first for my good girl.